The Froggy Match-it school trials are now finished and we are busy making adjustments to the reading and spelling games. We think the resulting app is going to be super! Thanks again to the teachers and children who played the interactive phonics games and sent their feedback. One interesting thing is that several teachers told us they sometimes found it useful to link Froggy Match-it on their tablet to the interactive whiteboard in their classroom. 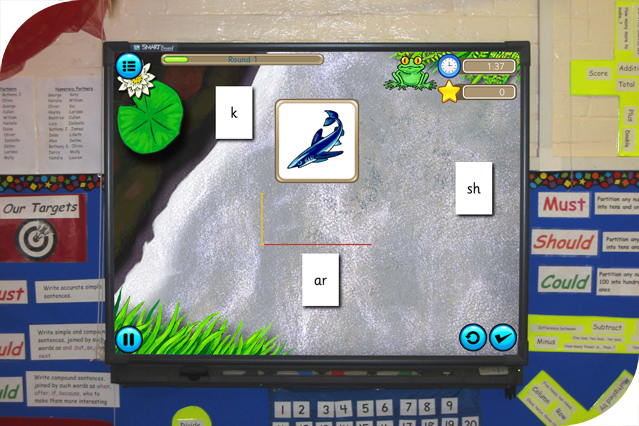 Some did this to use Froggy Match-it as a demonstration for a class phonics teaching session, whilst others chose to do this as a ‘starter’ for a class session where the pupils had individual iPads and later went on at their own pace and level with the Froggy Match-it games. We were also told by a few teachers that they linked to their interactive whiteboard because they didn’t have sufficent tablets, so a group did the games together using one iPad and the whiteboard. One literacy support teacher found connecting her tablet to the whiteboard useful when she had a group of older pupils with literacy problems. They were motivated and worked well collaboratively, supporting each other. Whatever the reason, it seems that the interactive whiteboard can be really useful with the Froggy Match-it phonics games app. Teachers we asked told us they link with the Apple TV connector, or wirelessly using Reflector 2.